From 22 to 29 April 2017, Grenada will be commemorating Vaccination Week in the Americas. In observance of Vaccination Week of The Americas, and the 40th Anniversary of the Expanded Programme on Immunisation, the Ministry of Health has issued this statement. Vaccination is commonly considered as “An Act of Love” and every year around this time, the Ministry of Health, joins the rest of the region and wider world in recognising the life-saving gains made possible through vaccination against deadly vaccine-preventable diseases. 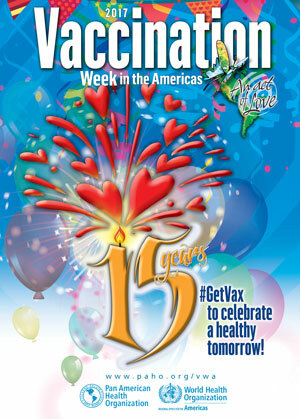 This year mark’s a double celebration – 15 years since this campaign begun and 40 years of the Expanded Programme on Immunisation by the Pan American Health Organisation (PAHO). The theme for this special commemoration is “GetVax to Celebrate a Healthy Tomorrow,” signifying the importance of having improved access to vaccination and highlights the tremendous benefits of immunisation to public health. Grenada can boast of an annual coverage of over 95% vaccination against 9 communicable diseases which children are routinely protected from, beginning at the age of 6 weeks, thereby decreasing the country’s vulnerability to outbreaks. Additionally, at the beginning of April 2017, the introduction of Hepatitis B, birth dose was included in the immunisation schedule. This achievement is due to the collaboration of Government and PAHO by making vaccines affordable both at the Primary and Secondary levels of health care. We can proudly say our vaccination programme continues to be successful and we are pleased to inform you that the region was declared free of measles in September 2016. However, such achievement does not warrant complacency. We know for a fact that ever so often there are frequent outbreaks of new diseases and the reemergence of others each year. Reference can be made of the current outbreak of Yellow Fever in Brazil and other South American countries. Therefore we ought to guard against diseases which were once eliminated; this calls for vigilance on the part of the Ministry and the general public. The Ministry of Health is cognisant that many persons are hesitant to receive vaccines, however, despite this opposition to the records indicate that vaccines continue to prevent deaths from over 21 diseases. Throughout this week, several activities will be staged in all Health Districts throughout the island, enabling persons to get the required vaccines as well as obtain vital information on immunisation and other topical health issues. In keeping with this year’s slogan, the Ministry of Health encourages everyone to protect themselves, their families, and communities by getting vaccinated to celebrate a healthy tomorrow.